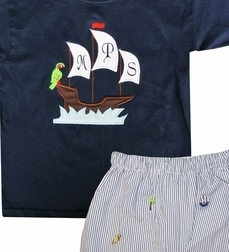 Here we have our EXCLUSIVE embroidered shorts and monogrammed, appliqued navy ship shirt to match. A one of a kind outfit and appliqued shirt found in no other store! We fell in love with this adorable embroidered navy stripe seersucker fabric and had it made into shorts for us by Zuccini. 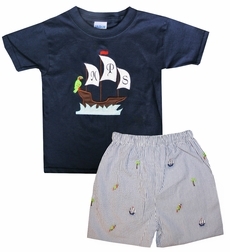 The shorts have ships, colorful parrots and tropical palm trees embroidered all over the navy seersucker. 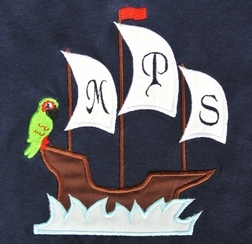 We then specially designed a ship applique with the little parrot posing on it to match the shorts! 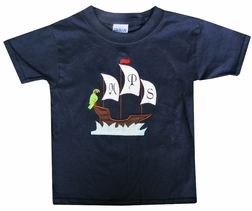 And because we love monograms, we designed the ship so that it has three white sails on which we stitch your little one's initials in navy. The ship is smoothly sailing on blue waves of water.